Congratulations Team Curiosity! 3/10/2014 | Travis the Warrior --- Kickin' Cancer! 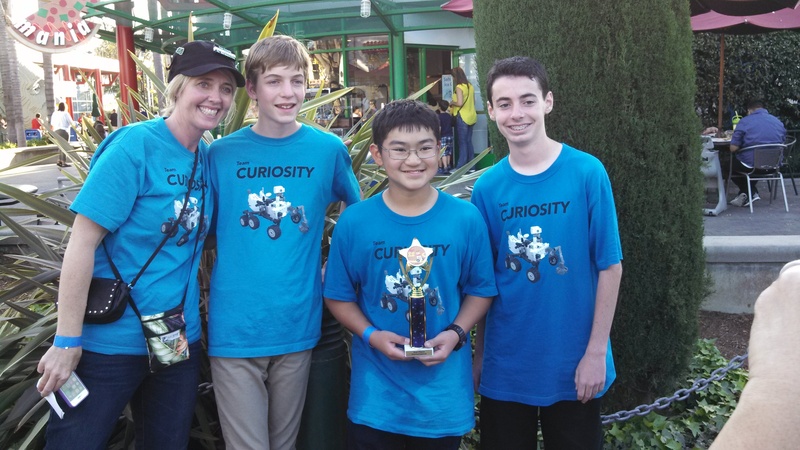 On Saturday, Tyler’s robotics team had their final competition of the year held at Legoland again. Even though the Robot Missions were new for this tournament, they had a similar format as previous events with judging in the Core Values, Robot Design/Programming and Robot Missions Competition. But it was also slightly different from the other events in that they added an “On the Spot” mission given out by the judges where they only had 45 minutes to decide how to solve the challenge, design and program their robot to accomplish the mission and then test it out before competing with the other teams. No pressure! The boys, Blake, Blas, Klaus and Tyler, did an amazing job once again working as a team and they ended up placing 2nd out of 40 teams in the Robot Missions part of the competition with the second highest score and second highest average of their 3 runs. Great job guys and way to finish out the season! There are definitely some future engineers on this team. Way to go Tyler!!! We’re so proud of you!! Congratulations Tyler and team. Way to go!!! Tyler we are so proud of you and your friends. Tyler, you are brilliant ….congratulations.